This suite is furnished with a spacious living area, the place for another 3 persons have kann.Dzahri has a small window to Mellah, serving only for ventilation, and 2 windows to the interior of the Riad. The bathroom is of course made entirely in tadelakt and has toilet, sink and a hip bath with shower. Towels and bath towels and toiletries are standard equipment. 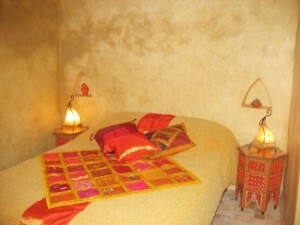 Our suite Dzahri distinguished by its huge peace.